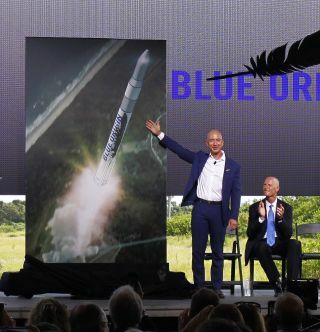 Blue Origin founder Jeff Bezos unveils the company's plans to launch a fleet of reusable rockets and spacecraft from Cape Canaveral in Florida during a media event on Sept. 15, 2015. Amazon.com founder and CEO Jeff Bezos isn't the only billionaire who wants to put his stamp on spaceflight. Bezos announced Tuesday (Sept. 15) that Blue Origin, the private spaceflight company he established in 2000, will manufacture and launch a fleet of reusable vehicles from Florida's Cape Canaveral Air Force Station, with the first flights scheduled to begin by the end of the decade. Blue Origin is developing reusable rockets and spacecraft to launch astronauts to both suborbital and orbital space. Reusability could spur the next big leap in crewed space exploration by dramatically cutting the cost of flight, advocates of the technology say. Blue Origin launched a successful test flight of its New Shepard suborbital vehicle this past April from a facility in West Texas, which will also host future launches of the craft. The company's biconic orbital vehicle, by contrast, will lift off from Cape Canaveral, atop a new rocket that Jeff Bezos (who is worth $34.8 billion, according to a recent estimate by Forbes magazine) and his colleagues are calling "Very Big Brother." Very Big Brother will launch and land vertically and reuse its first stage. The rocket will be powered by the new BE-4 engine, which Blue Origin is developing with launch provider United Launch Alliance (ULA). The BE-4 will also be incorporated into ULA's reusable Vulcan rocket. PayPal co-founder Elon Musk (who has a net worth of $12 billion) set up SpaceX in 2002, with the explicit aim of helping humanity colonize Mars. Like Bezos, Musk is a big proponent of reusable rockets, saying a fully and rapidly reusable launch system could make a Red Planet settlement economically feasible. SpaceX also won a $2.6 billion NASA contract to fly astronauts to and from the space station using a crewed version of Dragon. The agency awarded Boeing $4.2 billion as well to finish developing its CST-100 capsule, which is now known as Starliner; NASA hopes that one or both private space taxis will be up and running by 2017. SpaceX is also working on a powerful rocket called the Falcon Heavy, which will handle weighty payloads destined for Earth orbit and also send spacecraft toward Mars and other distant destinations. The Falcon Heavy's maiden flight should take place in 2016, company representatives have said. British entrepreneur Richard Branson ($4.8 billion) founded Virgin Galactic in 2004, with an eye toward creating a new tourism industry in suborbital space. The company is developing a six-passenger vehicle called SpaceShipTwo, which will be lofted to an altitude of about 50,000 feet (15,000 meters) by a carrier aircraft known as WhiteKnightTwo. At that point, SpaceShipTwo will be dropped and turn on its rocket engine, blasting itself upward to suborbital space. Customers will experience a few minutes of weightlessness and see Earth against the blackness of space before coming back down for a runway landing, Virgin Galactic representatives have said. A ticket to ride the space plane currently sells for $250,000. SpaceShipTwo is in the test phase and experienced a tragic setback last year during the vehicle's fourth rocket-powered flight. SpaceShipTwo broke apart in mid-air on Oct. 31, killing co-pilot Michael Alsbury and injuring pilot Peter Siebold. The accident occurred because Alsbury unlocked the space plane's "feathering" re-entry system too soon, investigators with the National Transportation Safety Board have determined. Paul Allen ($17.5 billion), who co-founded Microsoft with Bill Gates, is another billionaire with a longstanding interest in space. Allen helped bankroll SpaceShipOne, an experimental vehicle that won the $10 million Ansari X Prize in 2004 after getting to space and back twice within the span of five days. SpaceShipOne, which became the basis for Virgin Galactic's SpaceShipTwo, was designed by Scaled Composites, a California-based company led by famed aerospace engineer Burt Rutan. Allen and Rutan teamed up again in 2011 to form Stratolaunch Systems, which aims to launch satellites (and, eventually, crewed vehicles) beneath an enormous airplane — a setup designed to make spaceflight cheaper and more efficient. That plane, in fact, will be the largest aircraft ever built, with a wingspan of 385 feet (117 meters), Stratolaunch representatives have said. The company aims to fly the huge plane for the first time in 2016. Stratolaunch Systems is a subsidiary of Vulcan Aerospace, a company Allen unveiled in 2015. Vulcan Aerospace oversees the space projects of Vulcan, Inc., which Paul Allen founded with his sister Jody in 1986. Billionaires are also making a splash by investing in, rather than creating, space companies. For example, the asteroid-mining company Planetary Resources, which announced its existence in 2012, counts five billionaires among its investors — Google executives Larry Page ($29.7 billion) and Eric Schmidt ($9.1 billion), former Google board member K. Ram Shriram ($1.9 billion), real-estate developer Ross Perot, Jr. ($1.75 billion) and software architect Charles Simonyi ($1.4 billion). Another Planetary Resources investor, filmmaker James Cameron, is worth about $700 million.